Peter plays many different kinds of programs. But they all have at least a couple of things in common. They are upbeat, positive, lively, happy, rhythmic, etc. Some of the most typical kinds of programs are listed listed below. Upbeat, interactive shows featuring a wide variety of songs and styles. The goal is simply FUN for the whole family. Singing, dancing and silly behavior are encouraged! It's energetic and engaging for all ages. Always interactive, always fun! These shows are some of Peter's favorites because the kids and staff always appreciate him. Lots of movement, participation, and an interesting demonstration of lots of musical instruments and styles. Plenty of familiar children's songs, plus his own award-winning original tunes. The same energy, but with an added element of education. Includes song histories and stories to interest children in music and folk traditions from around the world. 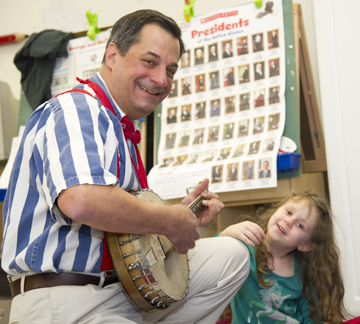 Little ones like the familiar songs, and school-agers really dig the funny songs Peter writes and performs just for them! And libraries are one of his favorite places to play because he loves to support the library's mission of encouraging children to read. 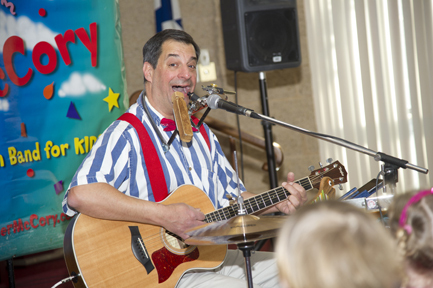 He has many original songs about reading, most of which he wrote for summer reading programs! A hands-on program that teaches kids the basics of writing a song. Peter helps the kids write lyrics and music to their own song. Along the way, he teaches them about song structure, writing hook lines, and developing catchy melodies. For groups of up to 25 kids. Peter has been told that there are not many performers who enjoy singing with toddlers. Gosh, making music with tods is one of Pete's favorite things to do. For the very little, Peter ditches the one man band stuff and just sits on the floor with the kids and sings, plays his guitar, harmonica and other mouth instruments. Toddlers seem to enjoy being up close, where they can touch the instruments. 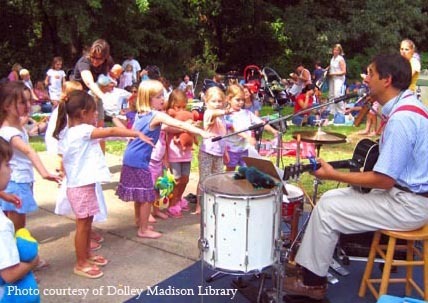 Little peeps sometimes can be overwhelmed with all the drums and the noise of older children. This show is just for them... quieter, gentler, very up-close. And it's always the classic songs of childhood they love. This is great for elementary schools! Peter typically performs one assembly in the morning for half the students, then another in the afternoon for the rest of the kids. In between he "goes on the road," visiting classrooms with his songwriting clinics. In smaller groups, the kids learn to write their own song. Then Peter and the kids perform it for the others in the class. Teachers love how the sessions support language arts SOLs, and demonstrate how the writing progess is really all about "rewriting." Custom performances tailored to particular themes or topics -- railroads, cowboys, seafarers, animals and nature, seasonal, whatever. If Peter can't find existing songs along a particular theme, he sometimes writes them! Custom performances just for birthday parties, family get-togethers, corporate picnics, senior citizen events, etc. Imagine a one-man band at your 50th anniversary. Yep, Pete's done that gig. All ages, all musical genres. A one-man band is must different, fun and memorable. To some folks, a one-man band is just not a one-man band unless he can walk and do it at the same time. Most of the time Peter sits when he plays, because he can play more instruments at the same time. But he also has a walking rig that lets him one-man band his way down the street for festivals, marches, parades and other special occassions. If you have a special event that needs an eye-catching oddity, ask about Peter's strolling one-man band skills. No matter what age, we're all kids at heart. And Peter's music is a hit at adult gatherings, too. Senior citizens really love his stuff. Peter can play pop hits, tunes from the old days, and noveltly songs that can make a party pop. Everyone enjoys watching all the instruments going at the same time. It's visual and fun. Peter's shows for adults are strictly clean and in good taste. No off-color material is performed. All content on this website © 2019, Peter McCory.